Long time ago when M was born I sewed this felt cradle for her (without a pattern...). Actually it's just a simple rectangle or cube, with a bottom of thin plywood board between the two felt layers. I used two wooden sticks and felted cord (that we attached securely through holes in the sticks) to hang it. Sizes are about 80 to 45 cm. In my opinion a newborn baby doesn't need very much, but warm and save surroundings are important. Our house is very open and the windows are large. For little L we found a temporary solution: in a corner of our bedroom we made this nearby mini nursery by surrounding the felt cradle with quite a thick felt curtain on a circular rail. I love the properties of felt very much: I punched little holes into the curtain and cut butterflies that seemed to be flying away... so beautiful when the sun came through! Die cirkelvormige gordijnrail is een goed idee, net als de uitgestanste vlinders. Ben nu een klamboe met vlinders aan het maken, maar dit was ook een leuk idee geweest! Ik denk dat je als kind helemaal welkom voelt als je dat je bedje is. wat mooi zeg Hetty, prachtig die vlinders!! het bedje is prachtig! en te gek dat jullie direkt aan het water woonen, als ik het goed zie door het raam!? This is the cutest cradle I have ever seen! So amazing, I wish I blogged about baby items right now... I would love to share this. so beautiful. and not lightbluegrey! This is so detailed and just lovely. Wow! This is so incredibly beautiful - what a lovely lovely space for a bub. I wish I'd thought of it when mine were newborns. We always had them in our bedroom and it would have been perfect. You're so clever! Hope you don't mind - I linked to it on my blog in my "People are so creative" list. Ooh, vandaag voor het eerst op je blog en oooooh wat een fijn plekkie!!! oh, goodness, this is beyond lovely! the cradle, of course, and the sweet butterflies. but i think it is that gnome mobile that has me completely smitten! zag het net bij Ohdeedoh en ik dacht, ik ga maar even bij de bron kijken! Wat prachtig zeg, helemaal te gek. my daugter is having a baby soon and she loved this idea of bed for her baby. do you sell or it is just for suggestion to make it ourselves? @ johanne: sadly the cradle is sold some time ago. Our youngest is 5 already! So I've posted it to inspire you. If you have any question, be welcome to email me. Thanks, and thanks for sharing all of your beautiful work! @ jennifer: the bottom is about 80 to 45 cm. Good luck! i can't tell you how much i adore this idea! and the little sheepie is jsut so adorable! These are so popular in Europe, I grew up with them... but when I went to try to find one for my new baby here in the US, no luck. I LOVE your version - oh my gosh, it is just gorgeous! I would like to try to make it myself. I have a couple of questions - how many cut pieces of felt did you use? I mean, are the sides and bottom separate pieces or did you cut it so there wouldn't be as many seams? I am worried about being able to make strong enough seams. But I'm not actually familiar with sewing with felt (other than little crafts). Also, did you put a mattress in the bottom, or just layers of felt over the plywood? THANK YOU for sharing this! @ Vera: thanks! The bottom and sides are one piece, the front and back are separate pieces. Use a large stitch on your machine. Sewing felt is no problem. Ironing felt neither. In between the two layers of felt we made a plywood board. On top of the felt layers we added a loose mattress. Good luck and please, send me a picture! adorable design and the handcraft. Great job! I will have my first baby in the summer and in my country there is not a tradition like this. 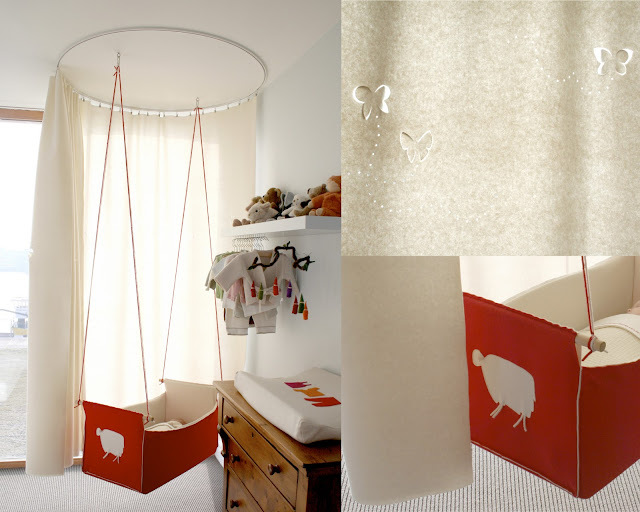 but i love this idea and want to make something like this for my baby. I cant use felt due to the weather being so hot in here but will use a thick cotton cloth instead maybe. Anyways, what i am wondering is that how long will i be able to use this, till 3 months or less or more? How long did you use it? Thanks for sharing such a lovely idea... cheers!